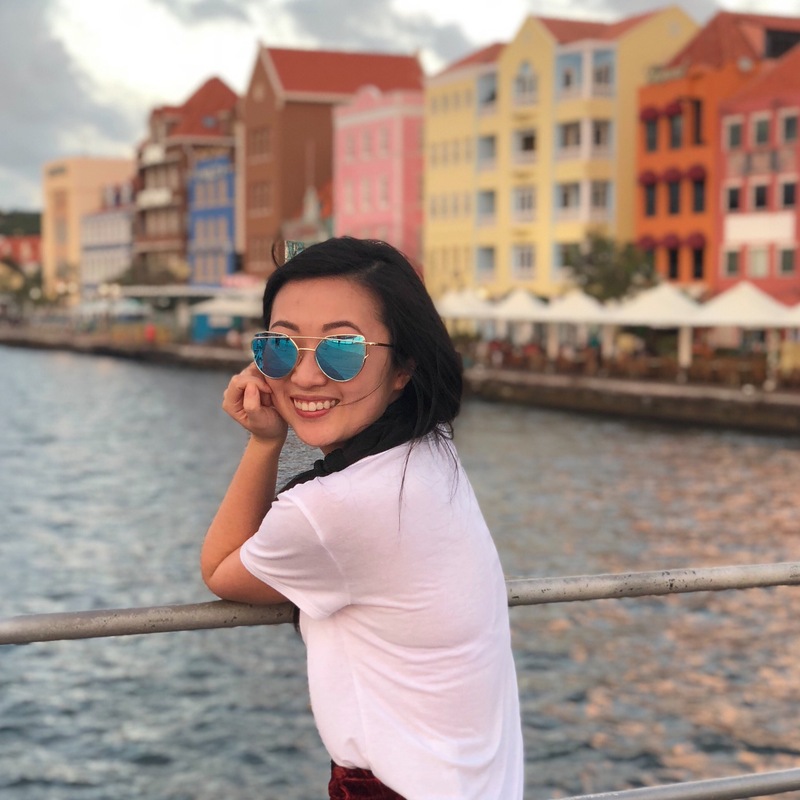 In an industry where products and shade names become more and more provocative, I was really inspired to see the positive inspirations behind the Pur Cosmetics Sweet 16 collection! I have never tried Pur Cosmetics before as I thought they do mostly loose mineral-based makeup. 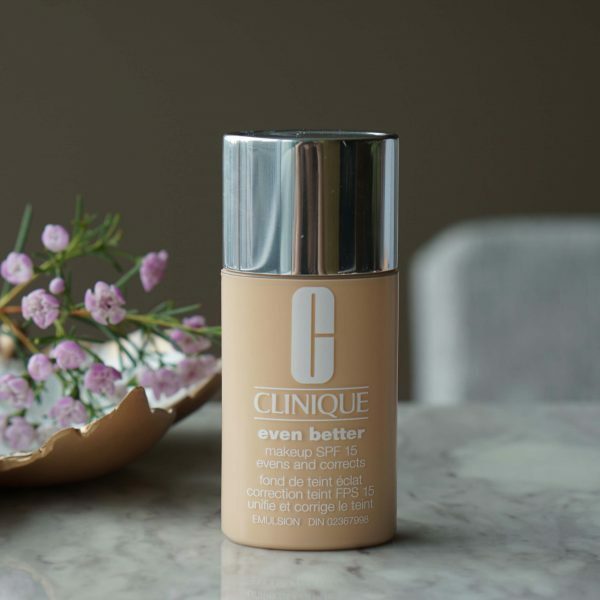 However, I found out they are available at Shoppers Drug Mart and beautyboutique online and have a wide range of makeup and skincare products available. To celebrate 16 years in business, the Pur Cosmetics Sweet 16 collection is a range of limited edition products and sets with a fun geometric and confetti packaging! 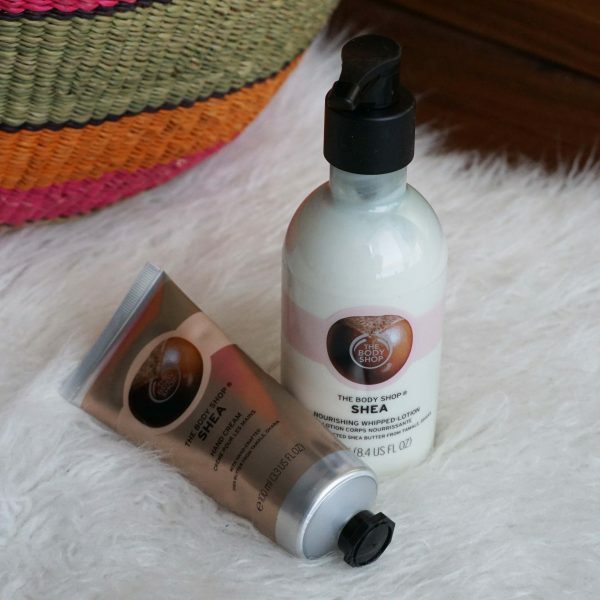 Normally, Pur Cosmetics products are packaged in black, silver and has more of a clinical feel. 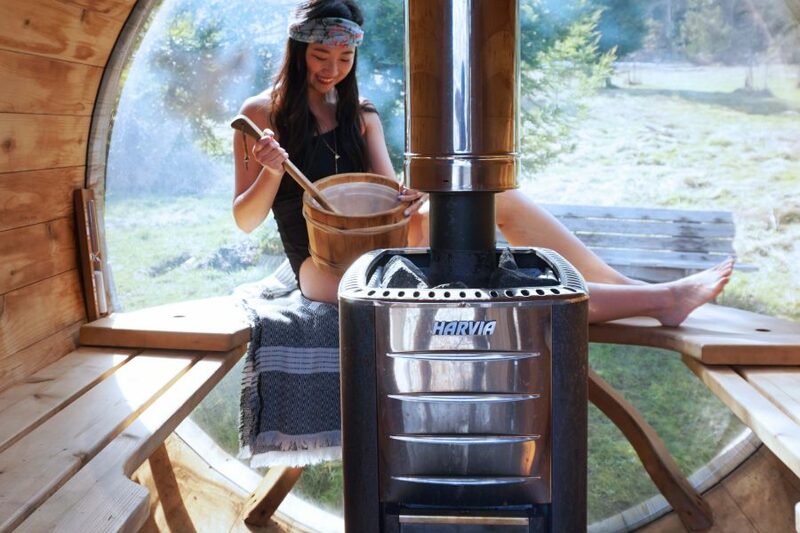 But the products in this collection looks high end, creative, and lots of fun! 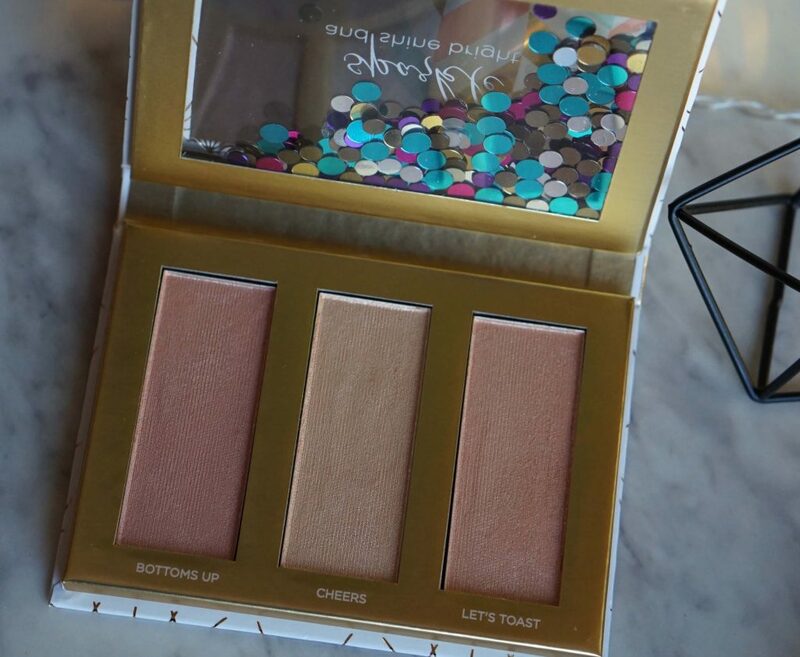 I have the Love Your Selfie 3 Sweet 16 Face Palette and the Sparkle and Shine Bright Highlighter Palette to share today. 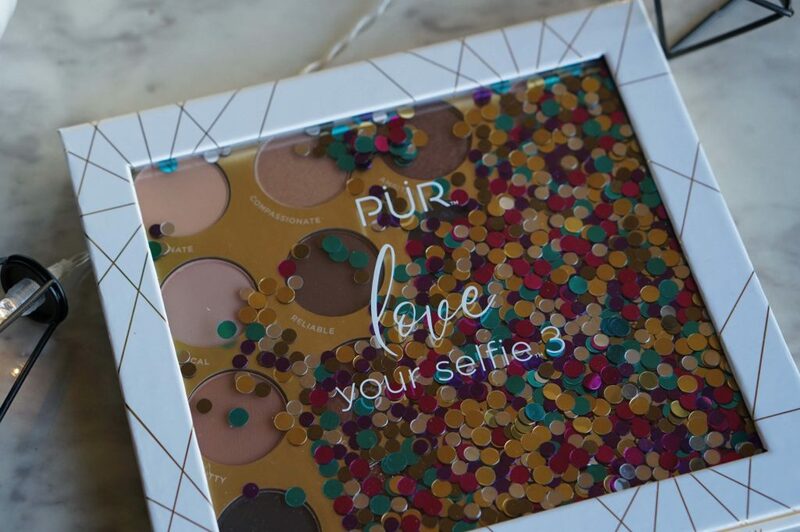 The Pur Cosmetics Love Your Selfie set comes with 12 eyeshadows, 3 cheek products, and a deluxe sized mascara. The set is priced at $39 which is such a deal considering the value is $255! 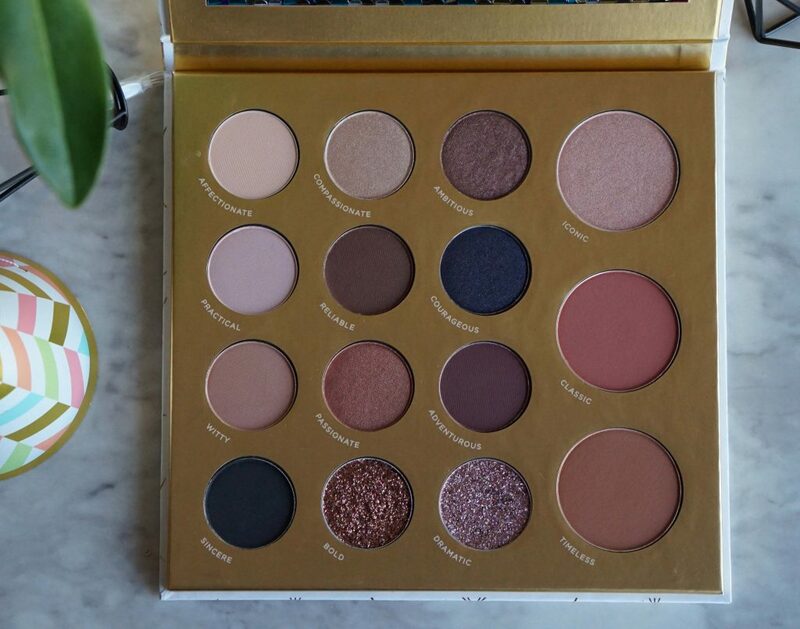 For those of you with a lot of eyeshadow palettes, the colors may not seem super adventurous. 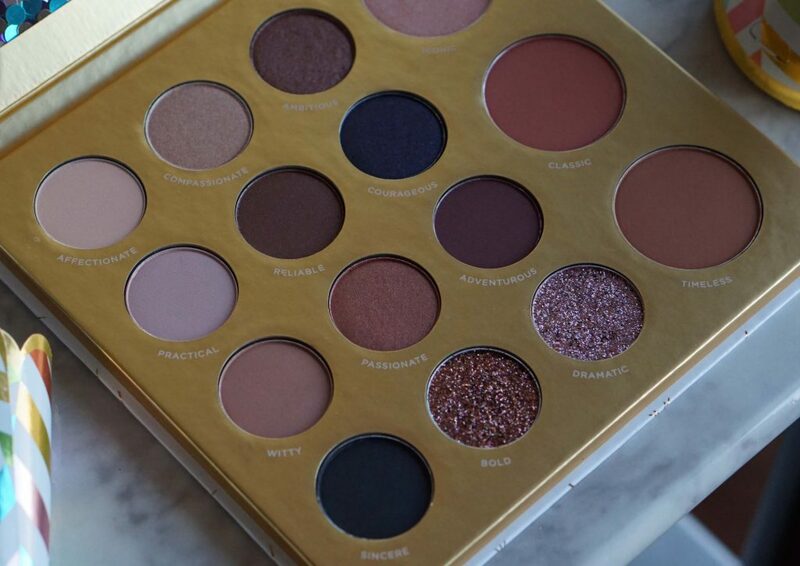 But I think this could be the ONE palette you need for every day neutral looks. 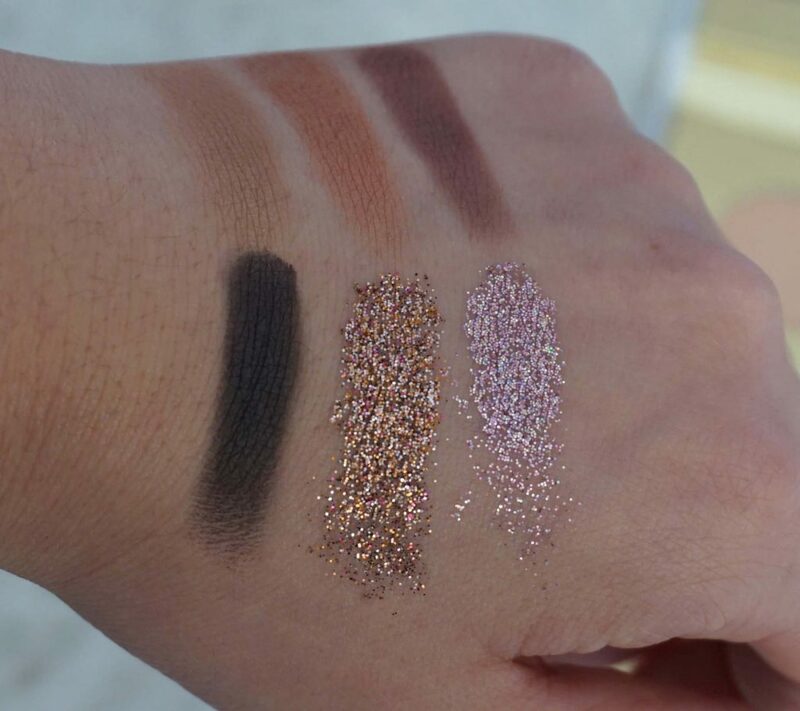 It also has two beautiful glitter shades for night time or more creative looks. Before I get on with the swatches, I just want to say how happy I feel that the shade names are all positive qualities we can aspire to have instead of sexual innuendos. It’s such a different take in marketing in this industry and I wish more products and brands would follow suit. Here are the first two rows of eyeshadows. 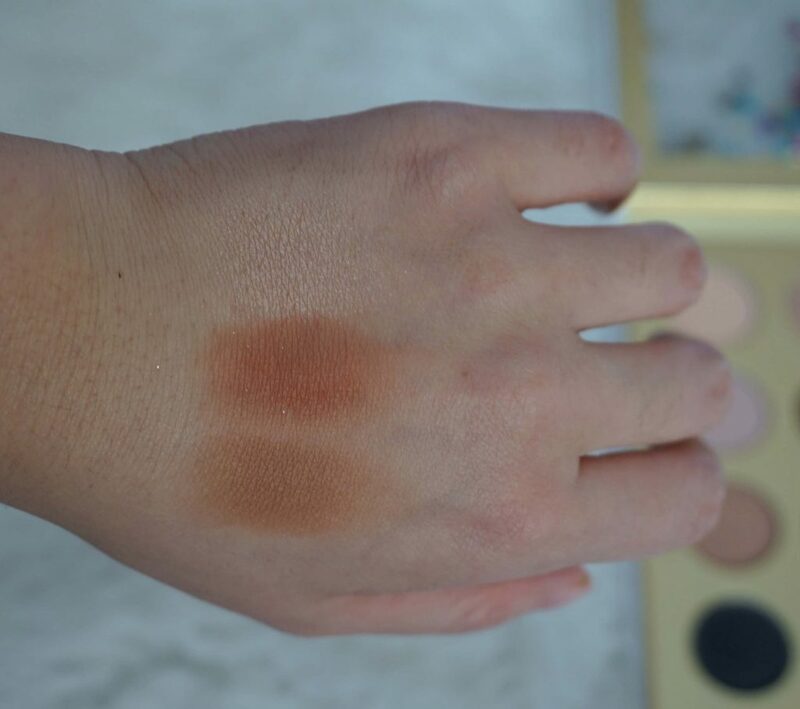 To be honest, I don’t reach for these 6 shades as often. The two matte shades are very smooth but too light for my skintone. It would be a nice blending color though for those with more fair skin. 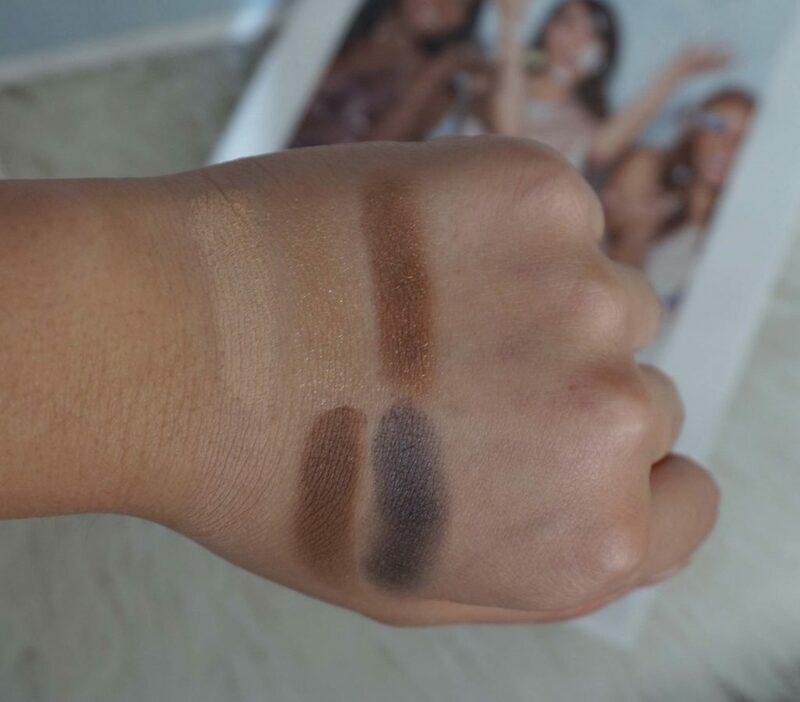 Pigmentation is great for all the shades with the exception of Courageous which swatches patchy. However, since I would only use such a deep shade as a liner, I had no issues in the actual application on my eyes. As such a neutral palette, I find this to be better for someone who do a rather similar look everyday. Since playing with this palette for about two weeks, I’ve used the combination of Witty and Passionate on a daily basis. I like that there is only one “crease shade” because you really only need one. I sometimes use Adventurous if I need to deepen the crease. Lastly, I like that there is a matte black shade included as it’s perfect for smudging out eyeliners and the lower lashline. So I didn’t touch the two glitter shades for a while because I just expected them to be a mess. Glitter is never easy to use and especially when it looks like loose glitter in a pan. One day I finally worked up my courage and tried using it on a brush and I was blown away. The pigmentation is so great and there’s lots of base in the formulation to bind the glitters together and on the lid. 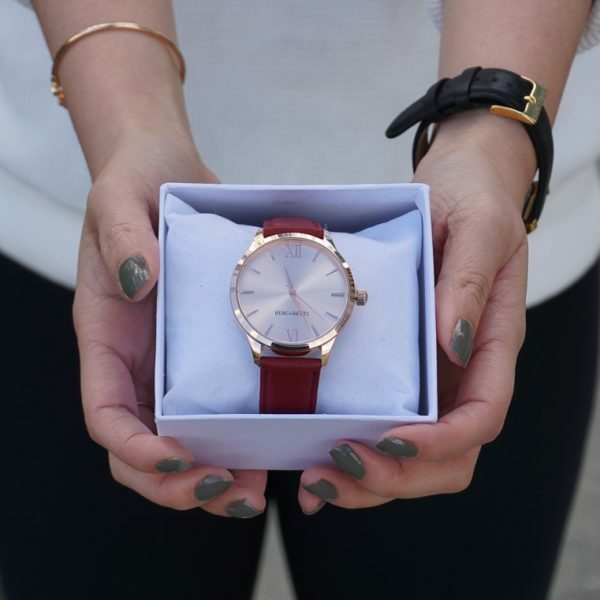 Check out the swatch below, it’s so beautiful! 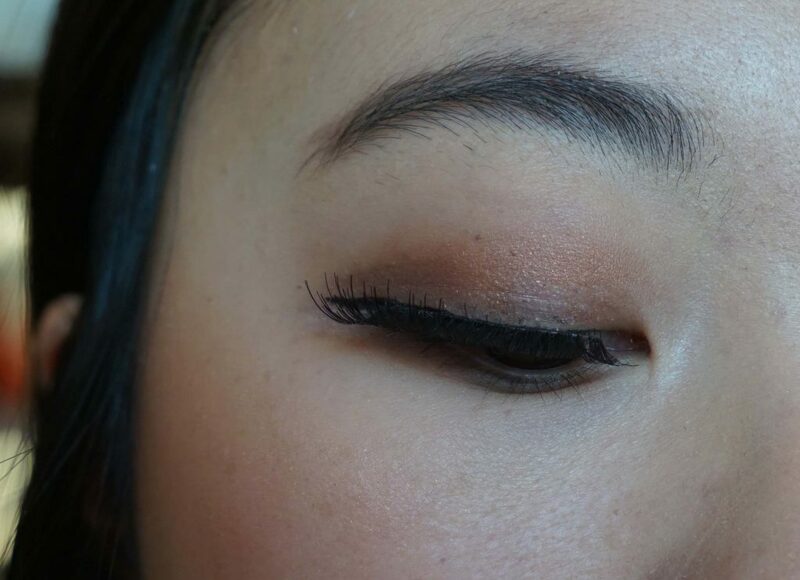 So this is kind of the classic neutral brown eyeshadow look I would wear on a daily basis. It’s nothing mind blowing but the shades work really well and all your basic needs are covered with this palette. It’s actually quite hard to find a palette that has quality eyeshadows and cheek products. 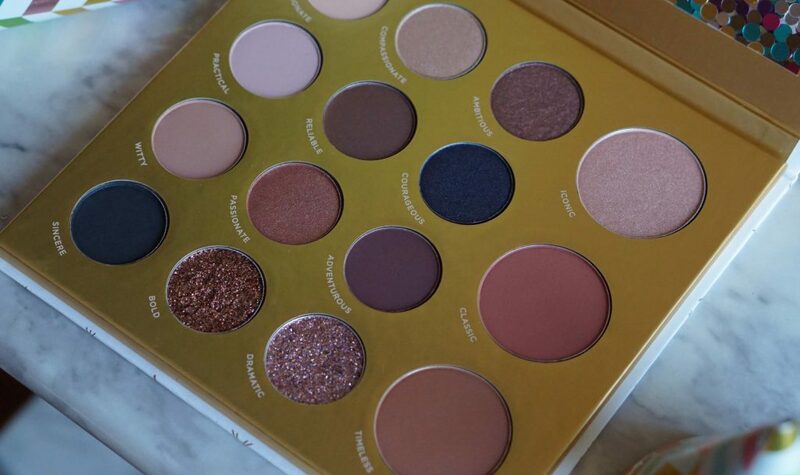 One that comes to mind is the Stila Perfect Me Perfect Hue palette but that’s about it. 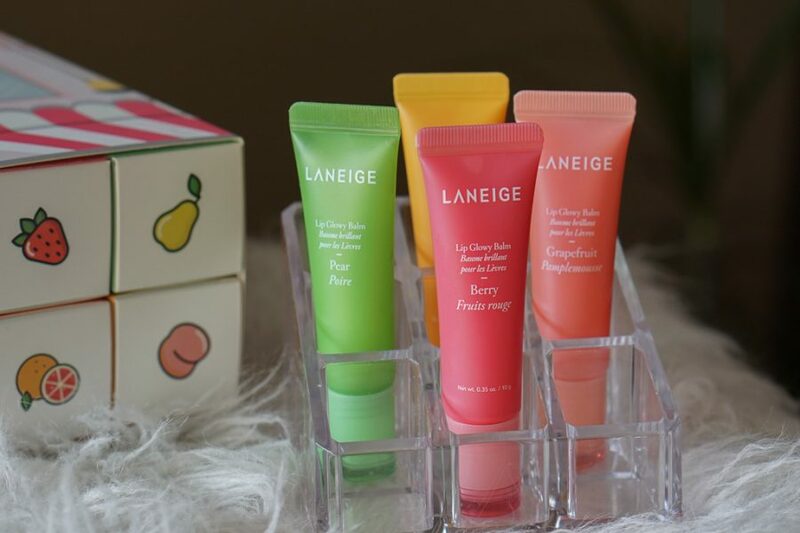 My favorite product out of the three has to be the blush. It’s a terracotta color that gives a beautiful rosy color to the cheeks and adds definition. The bronzer is nice as well and is a good color for contouring. 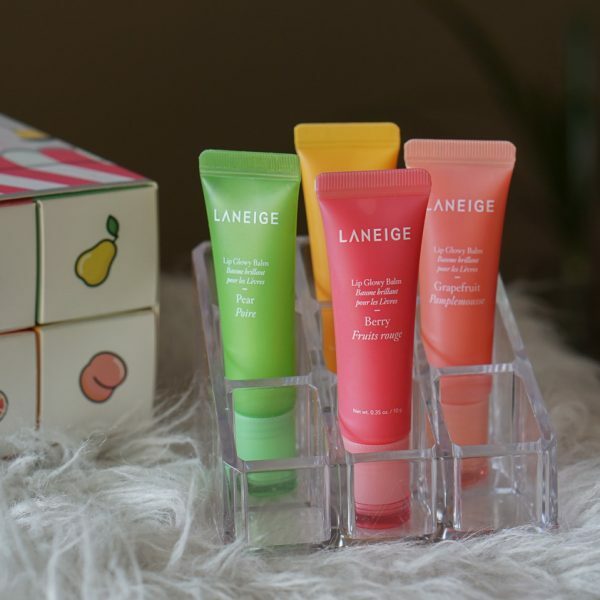 The highlighter is not my favorite as it’s lacking a bit in pigmentation and such light champagne colors are not as flattering on my skin. 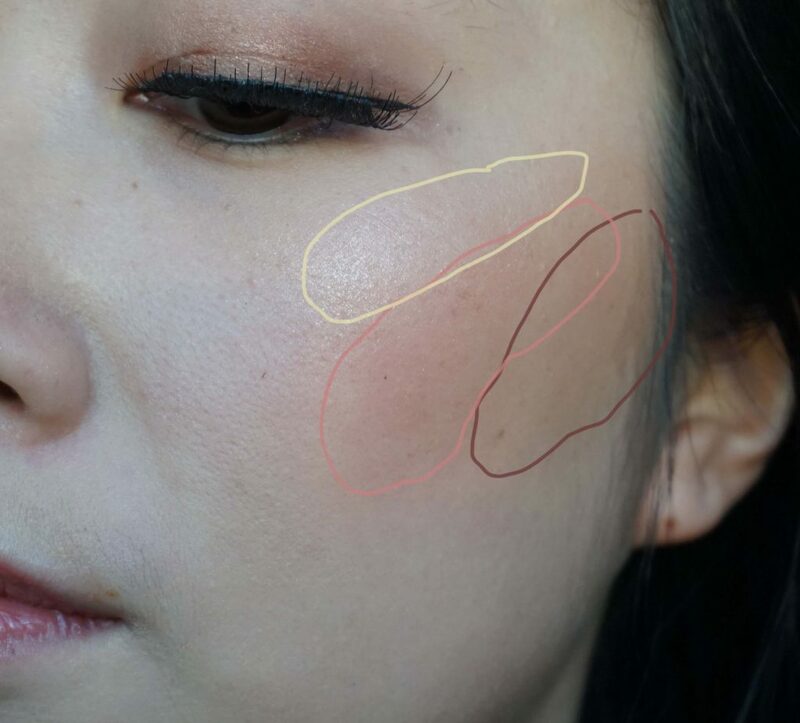 I drew out where I applied the three products and they all show up on the face nicely! 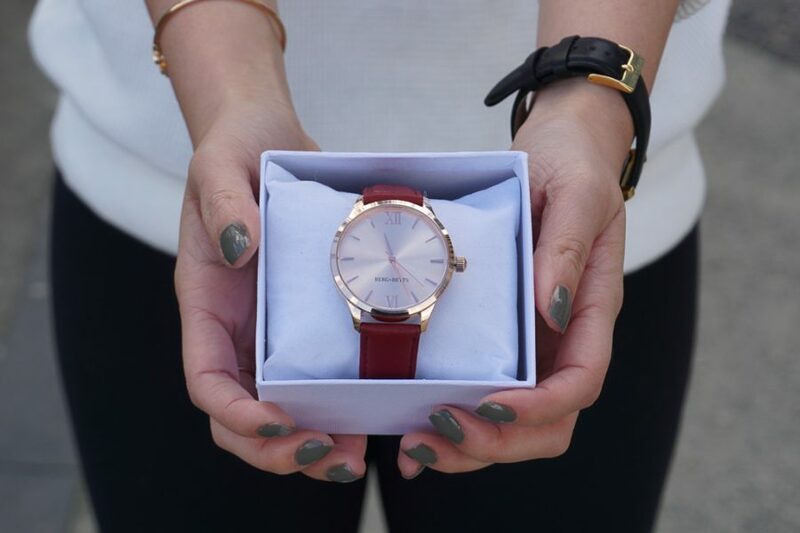 The brown colored blush turns into a pretty rosy color and looks so beautiful in person! I am very pleased with how the cheek products look and I can confidently bring this palette for travel to complete my eyes and face! 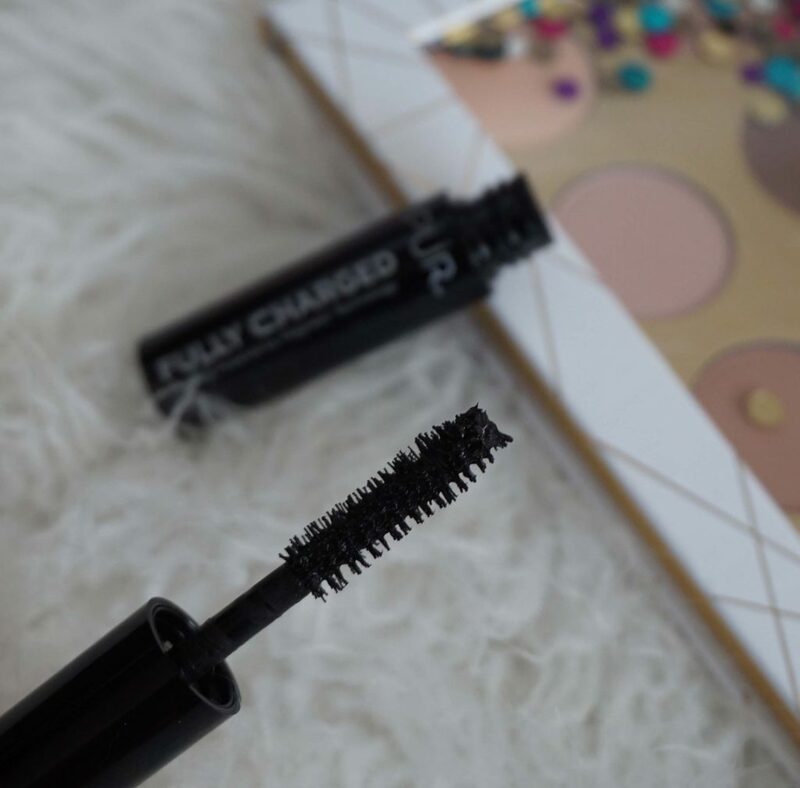 Lastly, you also get a deluxe sample sized Pur Cosmetics Fully Charged Mascara in the set. It has nicely spaced out natural bristles and provides excellent separation. However, the length and volume are just okay and it does the job for an every day mascara. 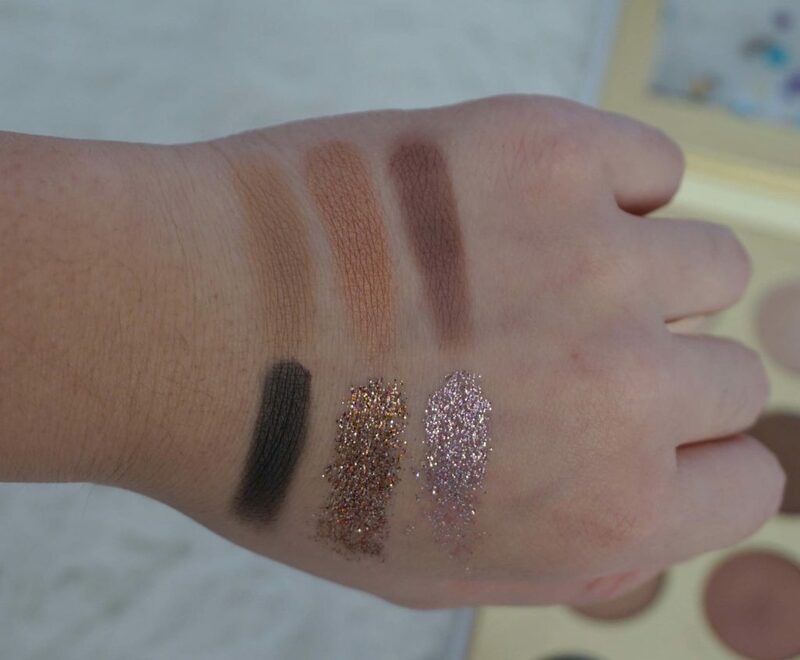 The other set I received from this collection is the Pur Cosmetics Sparkle and Shine Bright set. 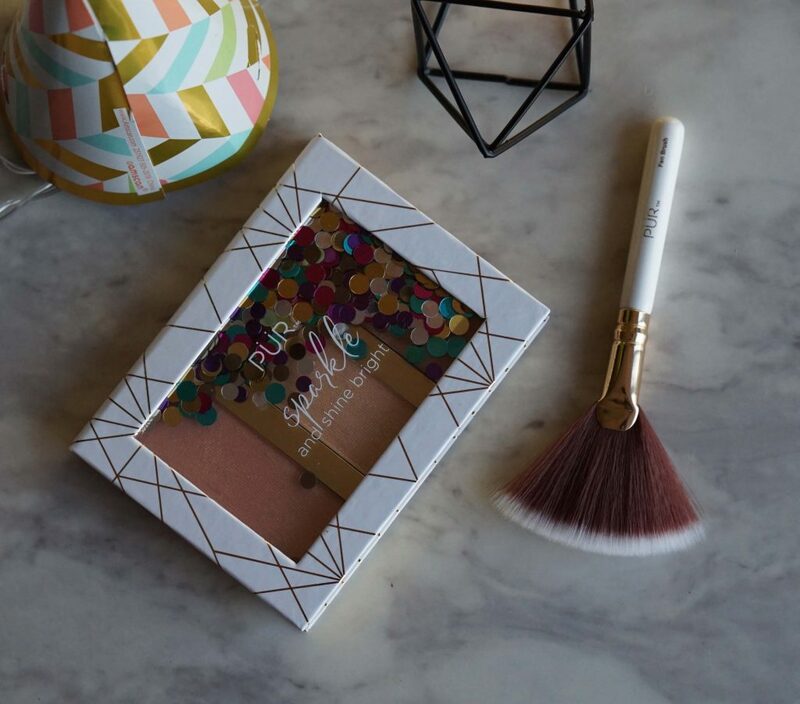 This little palette comes with 3 different highlighter shades and a fan brush. 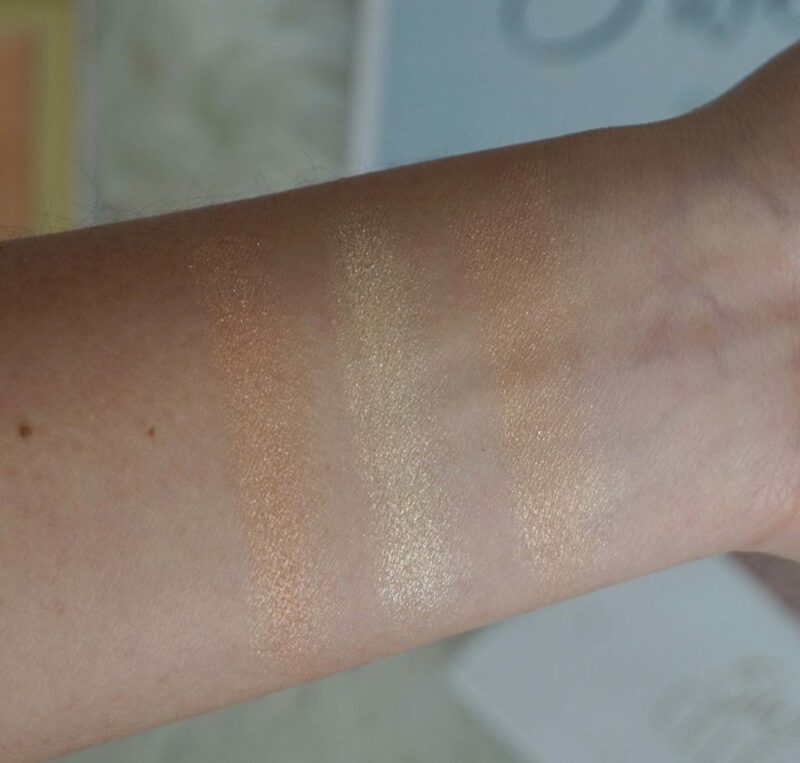 The highlighters have a different undertone to them: rose gold, gold, and peach. The pans are pretty skinny but most highlighter brushes will fit in okay. I find the formula applies better on the face than swatches. 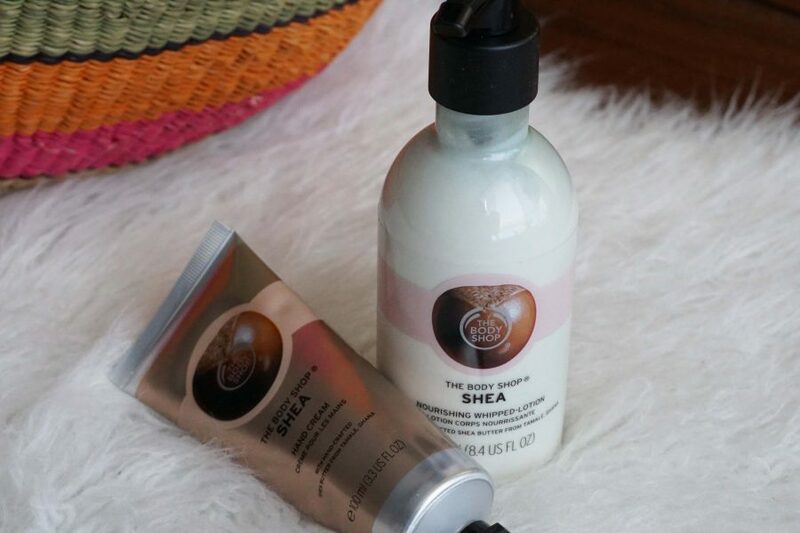 I actually used this products for a while and swatched them at the end for this blog post. The formula was slightly prone to separation when swatched and also there was more glitter than I expected. On the face, it has a beautiful sheen and glow but I can see now that there is quite a bit of glitter to the formula as well. The quality of the formula did not blow me away as much as the Love my Selfie palette did. However, this set is only $22 and provides a good variety of different highlighter shades for you to experiment and see what undertone looks beat on you. For me, rose gold highlighters are currently my favorite. But when photographing, I find a pure gold highlighter to give the prettiest reflection. Overall I’m very impressed and would definitely need to pay more attention to Pur Cosmetics. 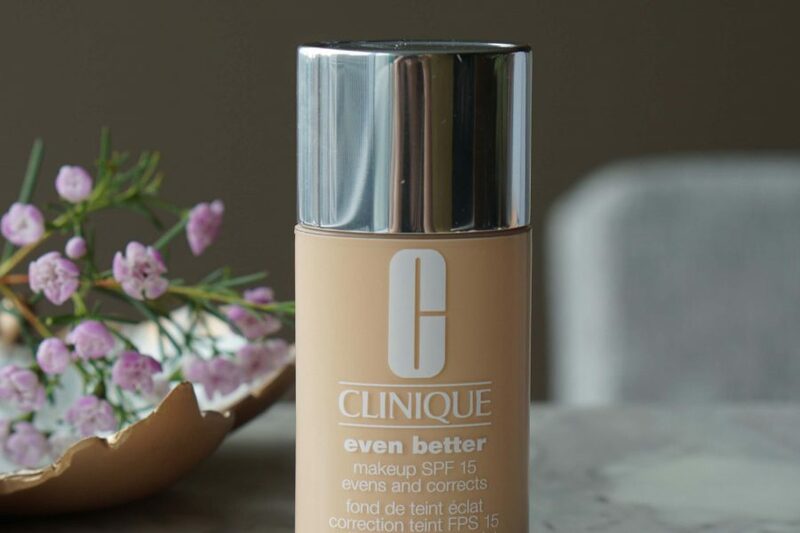 You can browse this collection on their website, on beautyboutique, or in person at Shoppers Drug Mart.